Make plans to join us for the annual St. Andrew's Mardi Gras Festival on February 22nd and 23rd, 2019. Please like and share this page for Festival information and announcements. We will be updating vendors, music, games, and contests as we get closer to the Roaring 20's Mardi Gras Festival in Historic St. Andrews. -9:00 AM: Vendor and Entertainment load in begins. -3:00 PM: Live music and entertainment starts. -4:00 PM: Vendors and shopping open. -4:00 PM: First parade starts. (Kid and Pet parade). -7:00 PM: Friday night headliner takes the stage. -10:00 PM: Day one closes. The Krewe of St. Andrew's is proud to host and plan this iconic Mardi Gras weekend for the 22nd year! Come on down to Historic St. Andrews in Panama City and party with thousands. This year's festival will feature great live acts, family fun areas, signature Hurricanes in commemorative glassware, full food and beverage options, games for the entire family, VIP experience, great live music on multiple stages, and so much more. If you are interested in sponsorship, vending, or volunteering for this year's event; please private message this page or reach out to chris@legistixsolutions.com. Krewes, business, individuals, and organizations interested in being in our parades are invited to private message this page for an application. 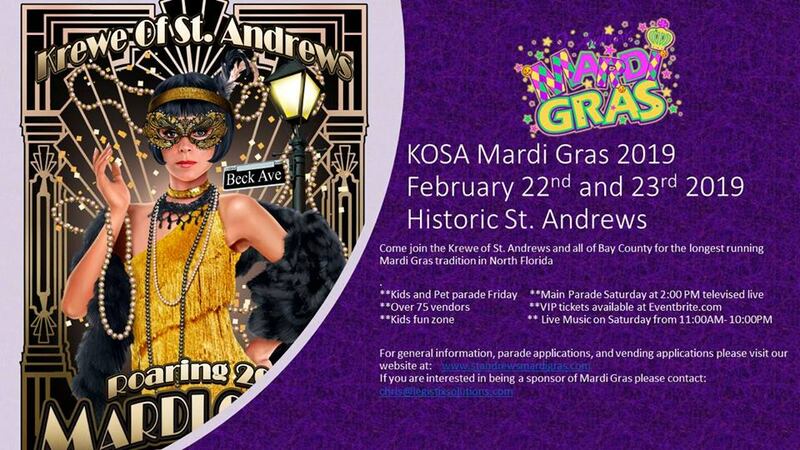 The Krewe of St. Andrews look forward to seeing you for a Roaring 20's Mardi Gras!